We all flourish in different areas of learning. Styles such as, Auditory, Visual and Kinesthetic gauge how we learn best. I have worked with students who would have otherwise struggled more in a classroom environment without the aid of technology and different outlets for producing work and meeting required outcomes. Let’s take *Jake, for instance. Guiding our students to make the right choices and choose what best works for them in the learning environment can be a challenge. *Jake was struggling to complete his work in most subjects due to sensory issues and self regulation. For this student to sit and try to focus for more than 8 minutes at a time was a complete challenge, and after realizing this was not helping him complete or even retain information each day, leading to his constant frustration, I was in dire need of finding activities and resources that might better suit his needs. Through this assignment I have stumbled upon great resources or “tools” that would benefit *Jake’s Kinesthetic Learning style, in the tool belt of learning. Digital tools have the potential to cater to the very needs of the different learning styles quite well. As an educator, it is a priority to make learning fair for all students, and giving plenty of opportunity to support students by providing different outlets. 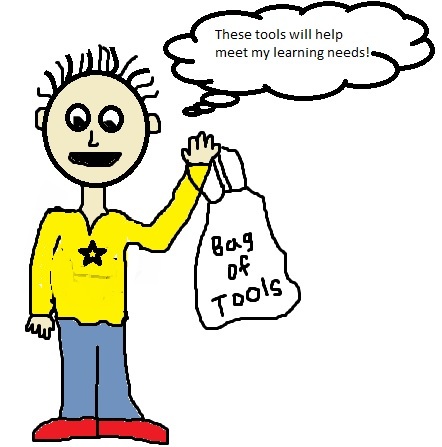 I have found some great tools that not only fit nicely in a digital tool belt, but can be easily accessed by students of all abilities, learning styles, and for all different types of tasks and activities. Once students are aware of the task that needs to be done, they are gaining their own independence by choosing the right tools that will help complete the task at hand. Utilizing learning tools will enable independence, enhance technology skills and most importantly, help prepare students for life beyond school. I found some tools for all three learning styles that I thought might be useful for educators and students to check out! For engaging young learners of all abilities and learning styles, check out https://scratch.mit.edu/ where you can program your own interactive stories, games, and more, and share creations with others in the online community. This site helps students to think creatively and work collaboratively. Kinesthetic Learners learn best by doing. These tactile learners prefer demonstrations and real-life applications, and “hands on” activities help them retain information and details. *Jake would benefit from a program such as, Google SketchUp, which is a free drawing software from Google that allows kinesthetic users to create, modify, and share 3D models. He might also enjoy Quizlet, which is a tool specifically designed to help students get involved in the learning process by letting them create their own flashcards and quizzes. Auditory Learners best understand information when they hear it. Students rely on their own voice and the voice of others to remember details. Some tools that may help Auditory Learners are NaturalReader, a text-to-speech software that can read web pages and other text out loud, and PodcastDirectory, a website where students can search for free podcasts by subject. Visual Learners best understand information by seeing it. Showing a visual learner pictures, charts, graphs, etc., will help them flourish. Tools that may help Visual Learners: MindMesiter, a mind-mapping tool to help students visualize what they're learning, and Visuwords, a graphically based dictionary that helps connect concepts and words to encourage retention.